Many people tend to overlook volleys, deeming them not as important as groundstrokes. While that may be true, without a transitional net game, becoming successful on the tour or even in college is very difficult. Take UCLA’s Gage Brymer for example. Ranked one nationally and being a three time Ojai CIF champion, he was a phenom in the juniors. Many people expected him to play somewhere at the top of the line-up (Single’s 1 to 3) for UCLA because of his tremendous results in the juniors. However, he ended playing the number 4 or 5 spot. Why was this the case? If you watch Brymer’s matches when he was a junior and especially in college, notice how he rarely ever transitions to the net. His match with Mkrtchian (https://www.youtube.com/watch?v=qb6mFdhkHic) is a prime example of his reluctance to approach. In many instances throughout the match, he would hit a damaging shot that would force a weak return capable of being easily volleyed away, but what does he do? He remains at the baseline, and you can even tell that he gives it a thought before he makes the decision. Mkrtchian ends up winning this match. While part of the reason may be because Brymer’s baseline game was not at its usual level that day, Mkrtchian was the one who utilized his transitional net game to great effect. His groundstrokes are not as good as Brymer’s, but what places Mkrtchian at #2 or #3 singles is his ability to attack the net and seize good opportunities, efficiently ending points. On the pro tour, it is inevitable that to be successful, players must have a transition game. Having that kind of efficiency not only expends less energy, but it also makes you more unpredictable. Without a doubt, the top four (Djokovic, Nadal, Federer, and Murray) are the most efficient players on tour. If they know one of their shots will yield a weak shot, they know immediately to begin transitioning up the court to take full advantage. 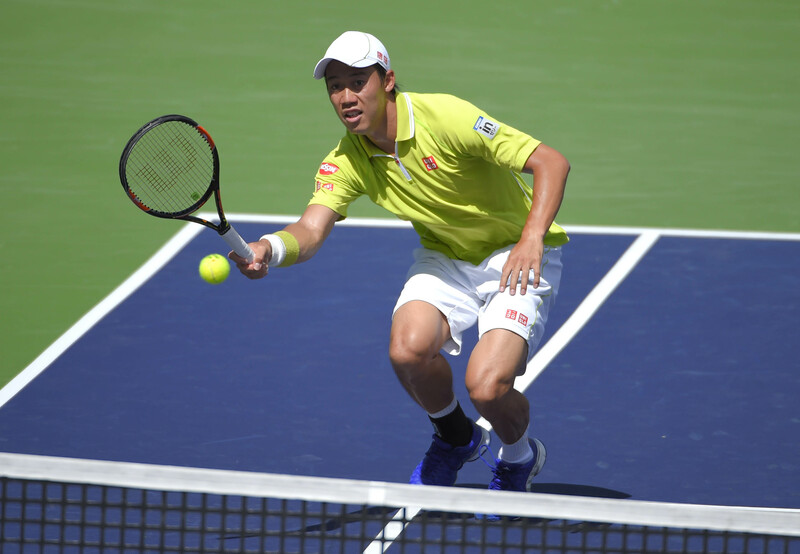 A notable player who has improved this aspect of his game is Kei Nishikori. He has made a tremendous stride on the rankings, beginning at #20 in 2014 and ending the year in the top 5. In his match against Tomic at Brisbane 2015, Kei Nishikori demonstrates clearly his improved efficiency by attacking the net and seizing the moment whenever the opportunity arises. Check out these timed videos to see how he transitions effectively. Nishikori, despite not having the biggest serve on tour, still has a very efficient serving game. He knows what does damage and is very well aware of how to best capitalize on weak shots. This is what all pros essentially know how to do and is what separates the level of tennis from college/juniors. Albeit having a great baseline game is heavily advocated, many tennis players tend to overlook how important having a transition game actually is, let alone possessing decent volleys. This entry was posted in Uncategorized and tagged advanced tennis instructions, american tennis, andy murray, college tennis, how to hit volleys, how to play tennis, how to play the net, kei nishikori, modern tennis, net game, novak djokovic, online tennis coach, rafael nadal, roger federer, simple modern tennis, tennis article, tennis blog, tennis coach, tennis efficiency, tennis strategy, tennis tactics, tennis volleys, transition game, transitional net game on March 29, 2015 by simplemoderntennis. Nadal’s nightmare is a man with an aggressive game(remember his matches with Soderling and Del Potro in ‘09). In fact, Nadal’s worst nightmare in recent time has become Djokovic because of how consistently he executes his aggressive game. Djokovic spreads the court extremely well, and he is probably the best at this currently on tour. His ability to change direction off both sides is phenomenal and this does incredible amounts of damage to Nadal especially when Djokovic plays close to the baseline. Nadal is known for playing rather far back so that means if his depth is off that day, Djokovic will be all over him baseline-wise since he plays close to the baseline and can comfortably take shots on the rise. His backhand rarely ever breaks down and can easily produce winners, which Nadal is not used to because the backhand is usually where he attempts to draw errors. He has a very solid high backhand shot which further puts Nadal at a disadvantage since this eliminates one of his go-to strategies (pounding the backhand with his heavy-spin forehand). His ability to go down the line sets him up perfectly to avoid Nadal’s forehand. Doing this enables him to have the forehand vs backhand exchange. This is what Djokovic looks for because his forehand is a more solid stroke compared to Nadal’s backhand. His forehand is very versatile. Can spin and flatten with power as he pleases and does so intelligently. What makes Djokovic even more difficult to defeat is that not only does he possess a strong aggressive game, but he has incredible defense as well. With that combo combined with his fitness, that means Djokovic can even go toe-to-toe with Nadal in lengthy and grueling rallies constantly shifting from offense to defense. Although Djokovic has great defense, that’s not his main strategy against Nadal; it is to be as consistently aggressive as he can. Being able to execute his aggressive playing style against Nadal frequently – unless Nadal is stepping up and playing close to the baseline – Djokovic will be in control of most of the rallies pressuring Nadal. If you view the highlights of their match in the final of Monte Carlo in 2013, you will see how Djokovic always tries to position himself close to the baseline and why Nadal has such a difficult time effectively responding. Against each other, what seems to be a huge factor in who is going to win the match is court position. In the video, you will see that Djokovic is hugging the baseline while Nadal is a couple feet behind the baseline in most points. Because of this situation, the balls are coming back towards Nadal quicker, leaving him less time to load up his vicious forehand or run around his backhand. In addition, the effectiveness of his forehand along with his backhand decrease as well, which of course, gives more time to Djokovic to execute his shots. They both in fact spread the court beautifully; it is just the players’ court positions that gives Djokovic the upper edge. In reality it is rather simple, Nadal either has to just be more aggressive by playing closer to the baseline (he does not really need to amp up his groundstrokes – especially the forehand – for they are penetrating enough) or he must laboriously grind out the points and out-rally Djokovic, which is definitely not the recommended tactic considering his knees. Ultimately, being passive against Djokovic will most of the time not work out, so the better and probably braver route is to definitely be aggressive against him. This entry was posted in Uncategorized and tagged novak djokovic, novak djokovic better than rafael nadal, novak djokovic defense, novak djokovic offense, novak djokovic strategy, novak djokovic vs rafael nadal, online tennis blog, online tennis instruction, rafael nadal, rafael nadal defense, rafael nadal strategy, simple modern tennis, tennis modern forehand technique online tennis tips online tennis instruction awesome tennis rafael nadal roder federer fundamentals advice coaches tennis blog, tennis tactics on March 22, 2015 by simplemoderntennis. Hey guys! School life has been busy applying to colleges and all that. But all of that is complete now and all I’m doing is awaiting acceptance letters. From here on for as long as I can, I will try to post an article at least once a week! This entry was posted in Uncategorized on March 18, 2015 by simplemoderntennis.